Hello to all of our friends! Before we get on with our post we want to give a HUGE thank you to Kim at Today's Creative Blog for the feature she gave Shanty2Chic today! It was such a heart warming feature and we are so flattered! Drop by and tell her we said Hi! She has a GREAT site going!!!!! Thanks again Kim for your kind words and feature! On with our post....We want to share our exciting news with ALL of you! 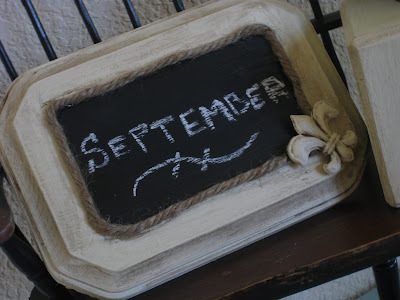 Shanty2Chic will be hosting our first ever Link Party and Giveaway next Thursday October 8! The theme for the party is 'I Made it Without my Hubby' to honor all of you women who have made projects without your significant other! ~We will leave it open until Friday October 9 at noon! ~ You must enter a project that you did without your husband! ~ Please link our party back to your post! How easy is that!!!!!!! Now, we want to encourage EVERYONE to enter! If you have never entered a Link Party now is the time to do it! We have a great Giveaway for one lucky winner and we will also be featuring several others! We know you will absolutely LOVE our Giveaway. We will be mailing the lucky winner a brand new pink hammer by Tomboy Tools! We know that you will LOVE to add this new accessory to your tool box...every tool box needs a little sass right!!!!! We want to be INSPIRED by all of your projects!!!!!! 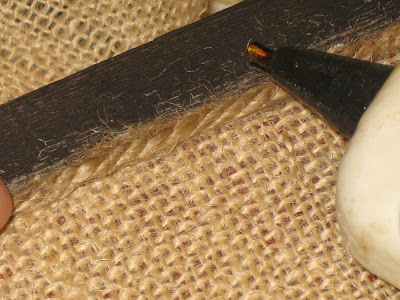 So get up, grab a brush, paint bucket, tool, glue...whatever your creative little mind conjures up and get to work! We can't wait to see what you come up with!!!!!! PLEASE GRAB OUR BUTTON TO GET THE WORD OUT! 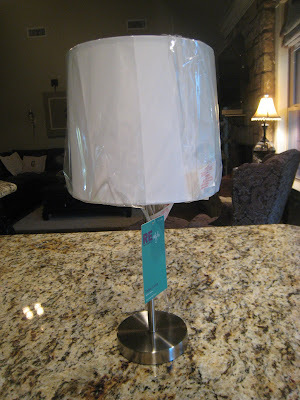 Whitney's $15 Lamp Makeover... WOW!! 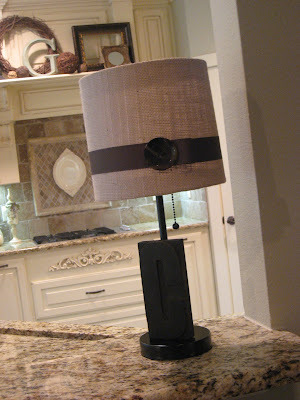 I started by painting the lamp with Rustoleum American Accents Canyon Black spray paint. 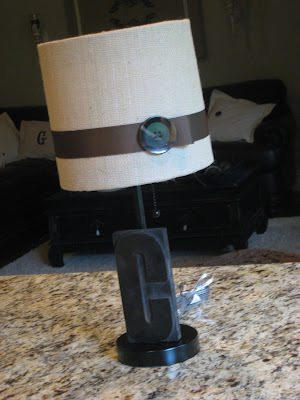 While that wa drying I took the shade off the lamp and layed it on a piece of burlap to measure how much I would need. I just added about 1 1/2" to each end and cut a long piece. 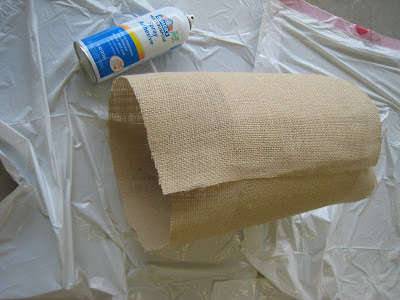 My next step was to attach the burlap to the shade. 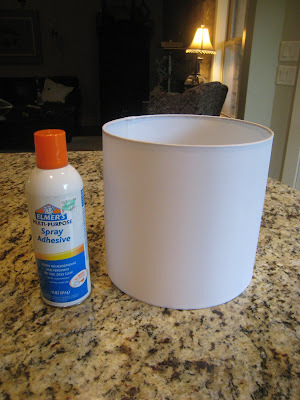 The drum shade made this super easy! I just used Elmer's spray adhesive to attach it. 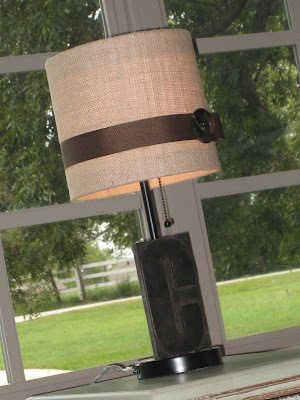 Spray a bit on the lamp and then roll it on to your burlap until you make it back to where you started... easy, easy. At this point I used my hot glue gun to pull up my extra fabric on each end. 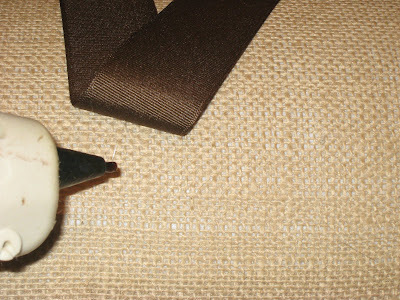 Just run a small line of glue on to the inside of the shade and then pull your burlap up... Make sure you pull snug to get a clean edge!! Now for the fun part... I LOVE antique press blocks. 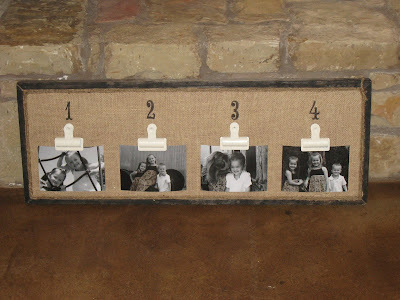 They are so cute and have endless decorative uses! The best place to find them is on Ebay! 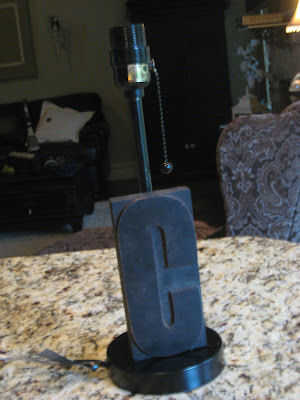 I found this "C" for $3. 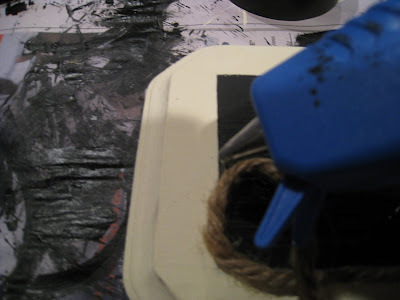 To attach it to the lamp I ran a small line of Gorilla Super Glue down the back of the block. I also added some to the bottom of the block. 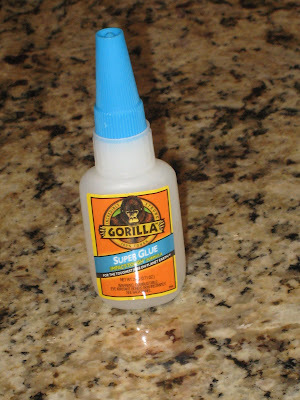 This glue set up in less than 30 seconds... LOVE it!! Once again...easy,easy! My shade was finished at this point but needed a little something extra. 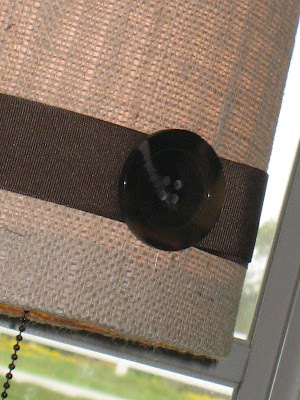 I used a thick strip of grosgrain ribbon and hot glued it 1 1/2 inch from the bottom of the shade. 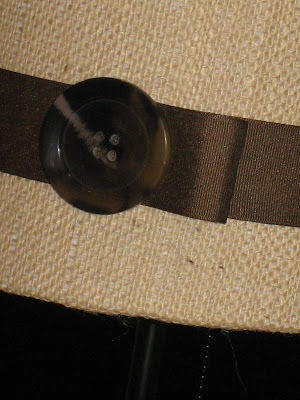 I used a lighter to keep my ends from fraying and made a loop at the end of the ribbon and glued it down to the shade. And... what doesn't look cute with a giant button on it?? LOVE it! Now I expect you all to go to Target now and start making your own!! Want to see it in action?? FINALLY!!! Don't forget to mark your calendars for our very first link party... I Made it Without My Hubby!!! We are hosting it on October 8th and it will include a fun giveaway! I expect ALL of you guys to be there!!! Ashley will be posting all the info on it by tonight so stop back by and check it out!! Thanks for stopping by!! 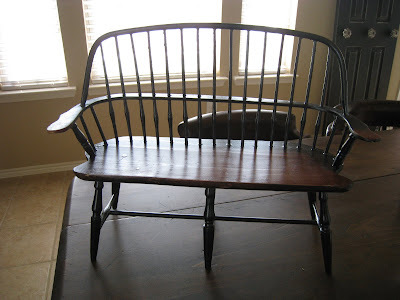 I will be posting this at The Shabby Chic Cottage for Transformation Thursday! 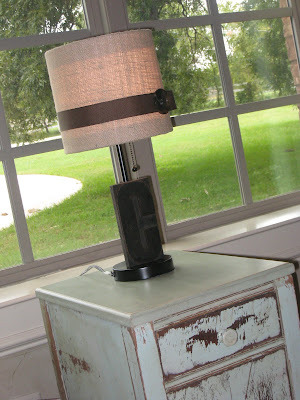 I will also be posting this over at Hooked on Houses for Hooked on Fridays... Check it out!! I will also post this at The Inspired Room! 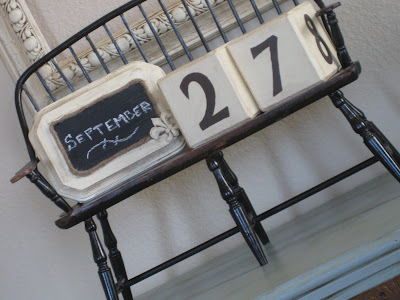 I will also be linking this post at DIY Day over at A Soft Place to Land!! 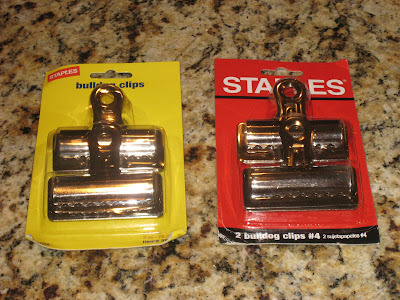 Your first step will be to paint your bulldog clips. I love these! I found mine at Staple’s for $2.50 a piece… I am sure they can be found cheaper. 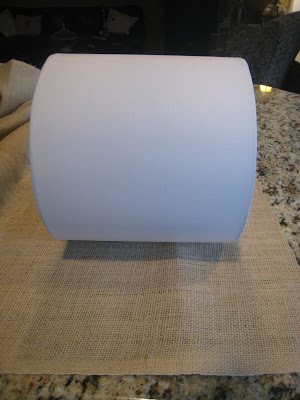 I use my Rustoleum American Accents Heirloom White spray paint on mine. 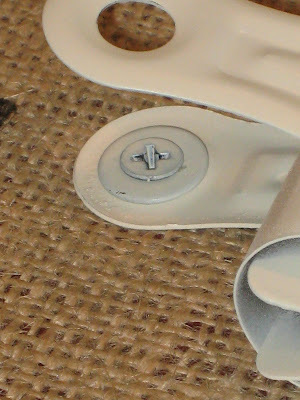 I also spray painted the tops of 4 wood screws and 4 washers as well that will be used to secure the clips. This is a solid wood piece but you can also use a large frame or just a large piece of unfinished wood from your hardware store. 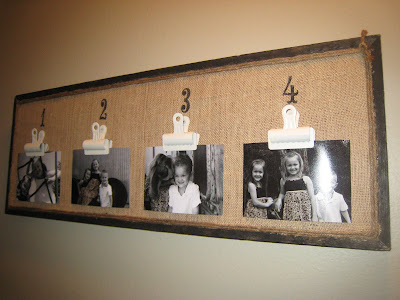 Your first step will be to attach your burlap. 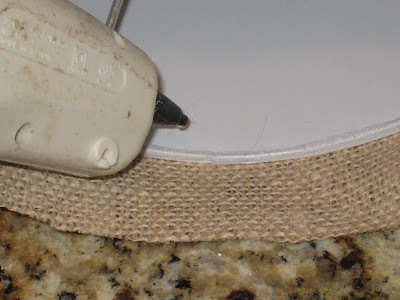 I used hot glue to attach mine starting at a corner and then pulling tight all the way around. 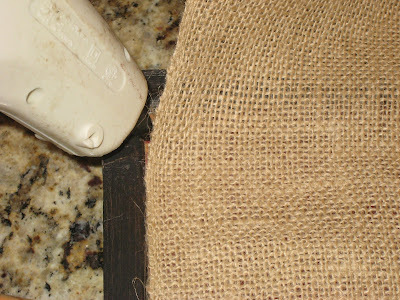 If you are using unfinished wood or the mat from a frame, just wrap the burlap to the back and hot glue it down. 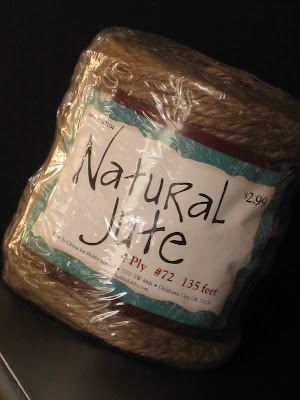 Next, I used jute twine to cover my rough edges. 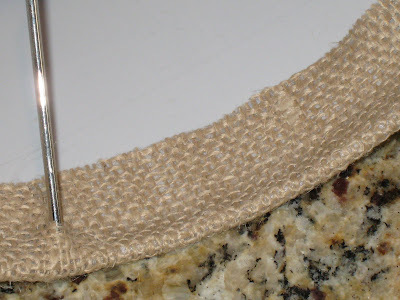 Just take your hot glue and run a small line down an edge to attach the twine. Once I made it around twice, I tied a small knot at the top corner. 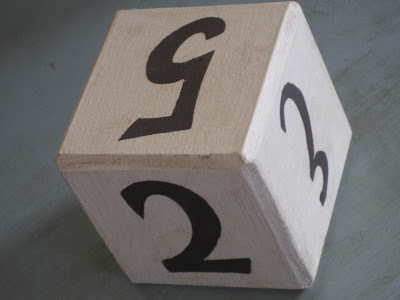 My next step was to stencil my numbers. I measured out where I would be putting my clips and drew a small dot to mark it. 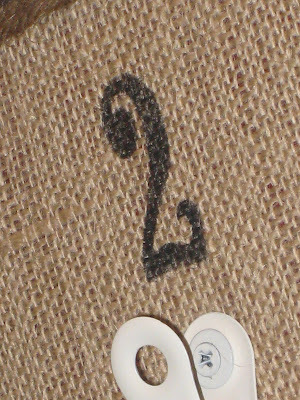 I then used my Cricut machine to cut my stencils… You can use premade number stencils too. 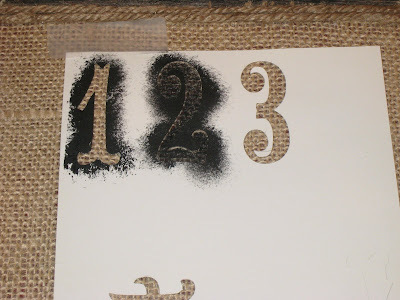 Using a stenciling brush I lined up each number and used Americana Ebony acrylic paint to stencil my number on. Go up and down with your brush… not side to side. 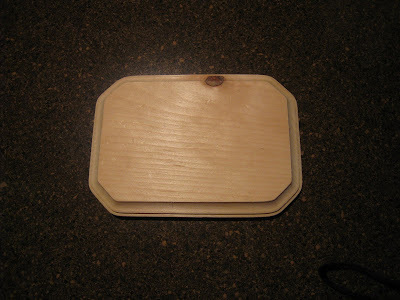 After letting that dry, I used my drill to attach the clips to the wood. 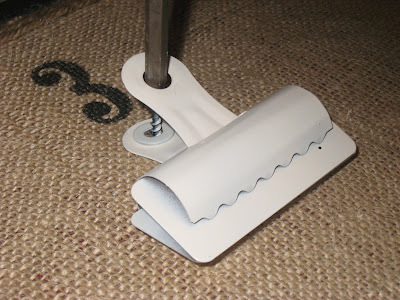 For those of you ladies that don’t have your own drill… It is time to go get one or ask the hubby for one for Christmas! This tool is obviously a must. 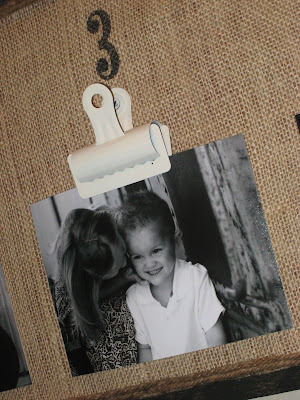 My last step was to add some black and whites I had developed of the kiddos. 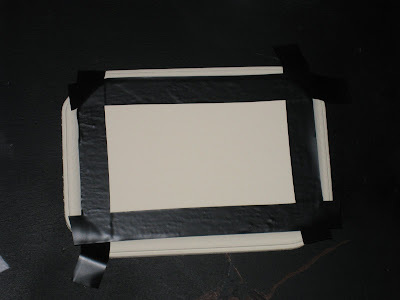 I used Walmart to develop my 5x7’s and they were under $1 a piece. Just clip them to your clips and you are finished. 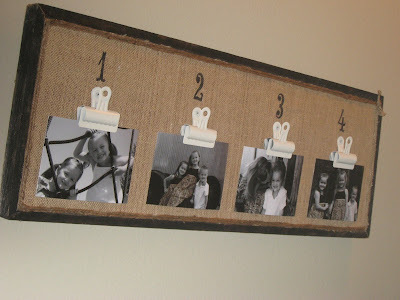 This is an inexpensive and fun way to display pictures, art, notes or really anything. I guess this is also your formal introduction to my three kids…. Thanks so much for coming by! 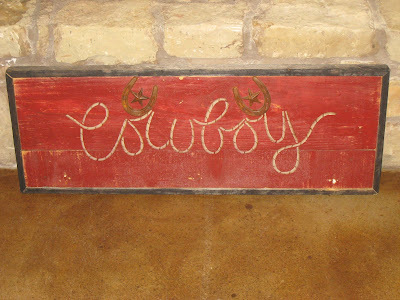 Stick around to see some of my great shantys I found in Round Top and to be part of our very first link party and giveaway on October 8th. We want to see any and ALL projects you girls have done without your hubby's help!! We are so excited about it and can’t wait to share more details! 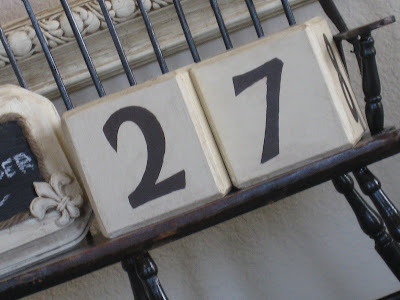 I will be posting this at Today's Creative Blog! Hey guys! I hope this post finds you all having a wonderful Sunday afternoon with your families! I have been crafting among many other things this weekend and I am excited to share my 'Weekend Whatnot' with everyone. 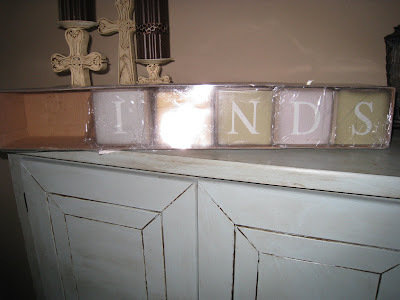 Remember these cheesy FRIENDS blocks that I found at Home Goods for $5.00? I only made 3 Vintage Looking Dice with them and after I gave Whitney a couple I still had two left over...well, I can't let anything go to waste and I remembered a set of cute little number blocks to display days of the month at Home Goods (they were much smaller and not something I would purchase but they inspired me!). 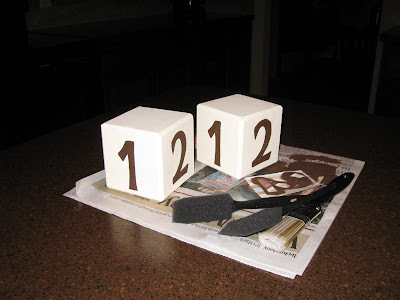 I then used Ralph Lauren Smoke Glaze to give the blocks a vintage look. 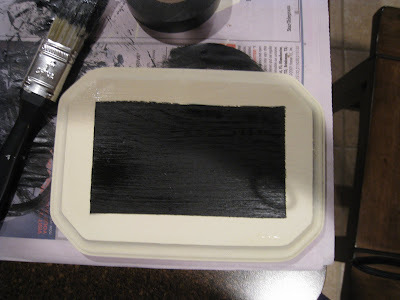 I painted this with Behr Cozy Cottage Satin and used electrical tape to tape off an area for a chalkboard. 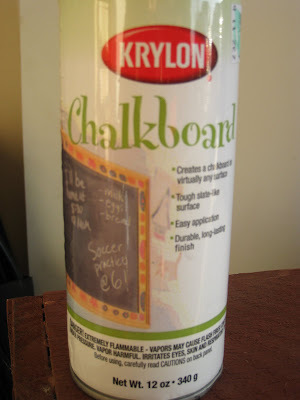 I used Krylon Chalkboard Spray Paint and it was super EASY! 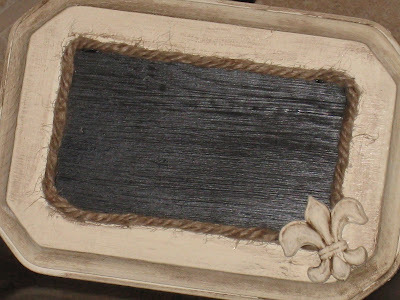 I then outlined the chalkboard area with 4 ply jute twine that I purchased at Hobby Lobby for $2.99. 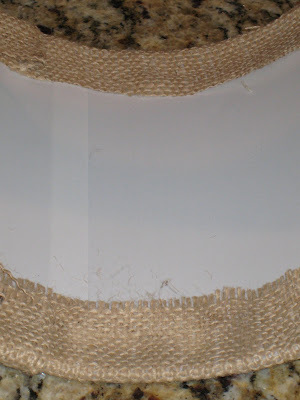 I used a hot glue gun to secure the twine around the edges. 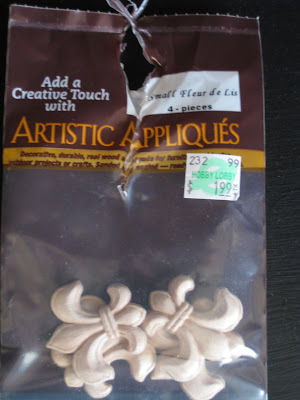 I purchased a 4-pack of unfinished wooden Fleur de Lis at Hobby Lobby for $1.99. 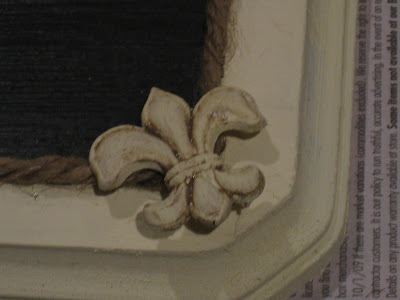 I painted one with the Behr Cozy Cottage Satin, glazed with RL Smoke Glaze and hot glued it to the corner to cover the seam from the twine. 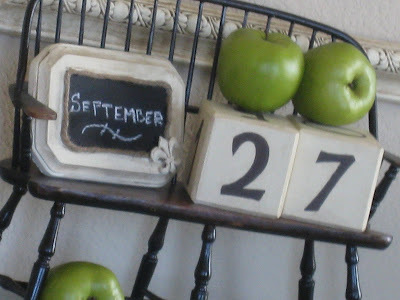 This was another fantastic find at Homegoods ~ $8.00 ~ I thought it would be a great way to display my date blocks! Hope this has inspired you! I hope you gals have a great week! I will be posting this at Today's Creative Blog Spot! 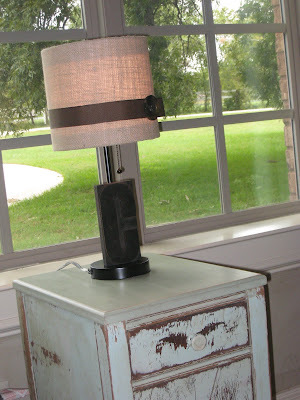 I will also be posting this at The Shabby Chic Cottage for Transformation Thursday!